Dahlias were such a revelation for me when I first got interested in gardening. I could not believe that the brown, wizened, dried up tuber in the packet would produce the dazzling blooms printed on the cover in just a few short months. Armed with some helpful advice from the sales lady (for instance which was the right way up! ) I gave them a try and I was thrilled with the results – they’re brilliant plants for beginner gardeners because you get such magical results so quickly – within a few months of planting the tuber you can get dozens of fabulous blooms. They are not technically frost hardy, which means in frost prone areas they won’t always survive the winter outside and you need to dig up, dry out and store the tubers somewhere frost -free, but here in the west of Ireland winters are usually mild enough to leave them in the ground. A good thick mulch around the base gives the tubers some protection from frost. The one thing to watch out for if you do leave them in situ though, are slugs in springtime who are on the march with deadly intent the minute the first shoots appear, and if you don’t stop them in time then brace yourself for a Dahlia departure! A scattering of organic slug bait just as the shoots are starting up is the best way to protect them, and once they get going they grow away very fast and are soon tough enough to withstand slug attacks. Once they get to about 30cm high, it’s a good idea to give them some kind of support –a stout stick will do – and tie in the growing stems to stop them snapping in summer storms. Once they start blooming, you can cut them for the house to your heart’s content, as the more you cut them, the more they grow. And best of all, they continue flowering right past the end of summer and on into autumn, usually until the first frosts, making them a wonderful source of colour later in the year when the summer flowering perennials have gone over. 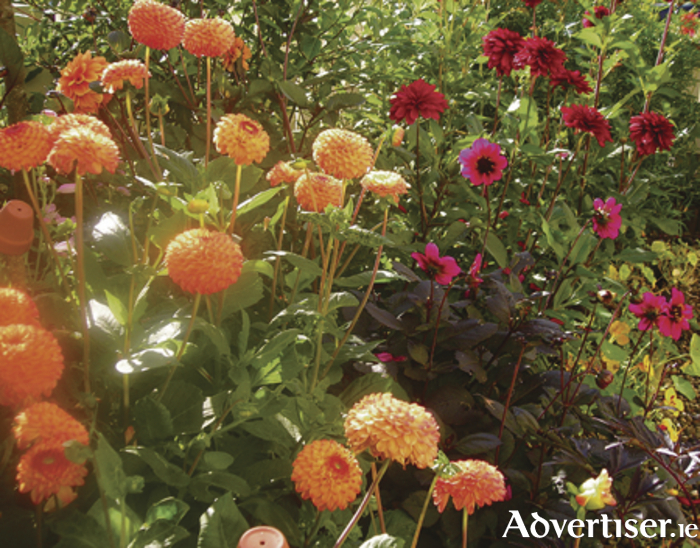 Dahlias come in every colour except blue, with single, double or pom-pom style flowers in every size from a golf ball to a dinner plate, so there is something in this fabulous plant group to fit in every garden. The reds, yellows and oranges sit really well in the late summer garden especially with slanting sunlight filtering through the petals. An old reliable is “Bishop of Llandaff” with single scarlet flowers and attractive bronze foliage, or “David Howard”, a lovely burnt orange double also with good leaf colour. You can often buy plants in growth in garden centres and just plant them straight into the garden, but starting them off indoors as tubers allows you to choose from a much wider variety than you can buy in pots. If you haven’t grown these beautiful blooms already do give them a try and I hope you too are dazzled by dahlias! Organically approved pellets such as Sluggo or Ferramol work just as well as the old fashioned kind and are much safer for other creatures including pets and children.